Lloyds Bank stars as FTSE 100 rockets in Q1 | City A.M.
After a great first quarter for stock markets, we assess the best and worst blue-chips of 2019 so far. It's been a storming start to 2019 for the FTSE 100 index, with popular interactive investor stocks including Lloyds Banking Group (LSE:LLOY), Next (LSE:NXT) and Tesco (LSE:TSCO) among those on a charge. No less than 47 top flight stocks posted double-digit percentage gains in the first quarter, with the London market part of a global bounce-back after the pounding for shares at the end of 2018. The FTSE 100 index surged 8 per cent to 7,279 in the three months, compared with the 13 per cemt gain seen for the S&P 500 in the best start to a year for the Wall Street index since 1998. A softer stance on US interest rates, easing trade tensions and China's stimulus efforts have restored global confidence, even if there are signs in recent weeks the rally may be slowing. From a UK investment perspective, annual results season and accompanying dividend announcements have been supportive in the face of so much Brexit uncertainty. 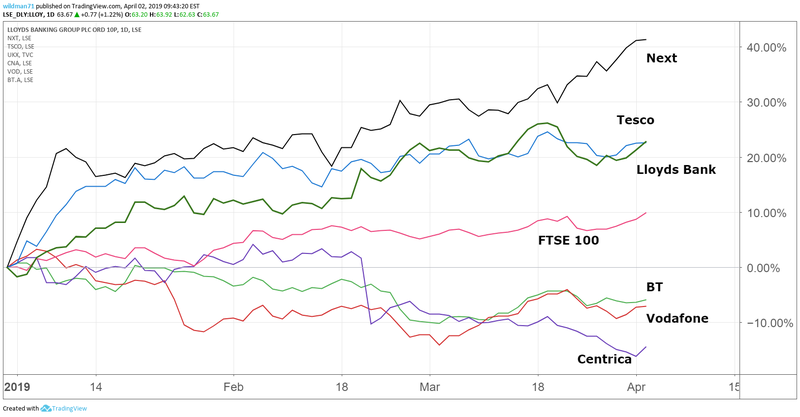 Only 15 London blue-chip stocks were in negative territory in the quarter, although worryingly for income investors they included already high-yielding heavyweights Centrica (LSE:CNA), Vodafone Group (LSE:VOD) and BT Group (LSE:BT.A). Shares in British Gas owner Centrica fell 15 per cent to finish the quarter at a 20-year low near 115p, as the prospect of another tough year fuelled City expectations that CEO Iain Conn will finally have to reduce the 12p a year payout, which currently yields near to 10 per cent. Fears of a dividend cut in 2019 are also depressing Vodafone shares, with the mobile phone giant down 9 per cent to 141.4p. The official line from CEO Nick Read is that the dividend will be frozen rather than cut as Voda focuses on reducing its debts. But faced with the expensive roll-out of 5G services, the telecoms giant may find it has to deploy its cash elsewhere. Dividend fears have also played a part in BT Group's disappointing quarter, with analysts speculating whether new boss Philip Jansen will use maiden annual results in May to cut the pay-out in favour of investment. While a dividend reduction in November's interims failed to hurt shares, the autumn rally for BT has been followed by a 6 per cent fall in the first quarter. Other high-profile losers included Sainsbury's (LSE:SBRY), whose shares fell 11 per cent in Q1 after the Competition and Markets Authority took a dim view of the supermarket's Asda merger. Turbulence in the airline and travel sector, as highlighted yesterday by easyJet (LSE:EZJ) following a profits warning, meant International Consolidated Airlines (LSE:IAG) was down 17.2 per cent and TUI (LSE:TUI) slid 34 per cent. The latter has endured a miserable 2019 so far, with the second of two profit warnings triggered by the recent grounding of its Boeing 737 Max planes. Asia-focused banks HSBC (LSE:HSBA) and Standard Chartered (LSE:STAN)have also struggled to make headway, whereas UK lender Lloyds rose almost 20 per cent to 63.1p in the quarter. That's only small comfort for long-term investors, however, as shares were trading at this level last August. Brexit uncertainty continues to hang over the stock, even though annual results in February appeared to show Lloyds in rude health following improvements to various key metrics such as the net interest margin and the all-important capital ratio. Lloyds shares trade on just 8.2 times earnings per share estimates for 2019, at a big discount to European peers, and yield 5.4 per cent. That's promising enough for a large number of analysts, with long-time supporter Jason Napier at UBS recently placing an 80p price target. One of the most surprising names near the top of the Q1 risers board came from the beleaguered retail sector after Next rose nearly 40 per cent to 5,596p in the period. Recent results showed more resilient trading, with Next's prodigious cash generation enabling an increase to the dividend and the completion of yet another share buy-back. Opinion on Next's immediate future prospects is mixed, with the market consensus of the shares at “hold” after the recent strong run for shares. Like Next, housebuilders have defied the Brexit gloom following a resilient start to 2019. High-yielding Taylor Wimpey (LSE:TW.) and Barratt Developments (LSE:BDEV) are both up 29 per cent for the period, helped by factors such as high UK employment, affordable mortgage finance and the continued availability of the government's Help to Buy scheme. A rebound of 28 per cent for British American Tobacco (LSE:BATS) merits closer attention, particularly after such a dreadful 2018 when the stock was battered by US regulatory fears to post the biggest fall in the FTSE 100 index with a drop of 49.5 per cent. Software solutions firm Micro Focus International (LSE:MCRO) is also enjoying a much better 2019, with its first quarter share price rise of 44 per cent only bettered by Ocado Group (LSE:OCDO) after the high-flying blue-chip newcomer announced a deal to provide Marks & Spencer (LSE:MKS) with a grocery delivery service. Shares in M&S, which is to buy a 50 per cent share of Ocado's retail business for £750 million, rose 13 per cent in the quarter despite saying it will fund the deal through a 40 per cent dividend cut.